Over at Fuse 8, there's a poll being compiled, and Elizabeth wants our top ten picture books. I know I am fond of saying that my favourite picture book is the last one I've read! Still, I forced myself to come up with a list of ten. These are the ten I'd choose this week if I wanted to really wow an audience, because I just know kids will love to listen to them as much as I enjoy reading them aloud. When I went to send my choices to Elizabeth, I realized too late that she stipulated the books must be ones Americans are familiar with. Now, I'm fairly sure that two of my books have never been published in the USA, so I doubt Americans are familiar with them. Pity, because they are great books. So that stopped me from joining in. However, I decided to have a Book Chook Top Ten Picture books right here. With the caveat that these are this week's top ten. I fully expect next week's list to be different, but just as wonderful! 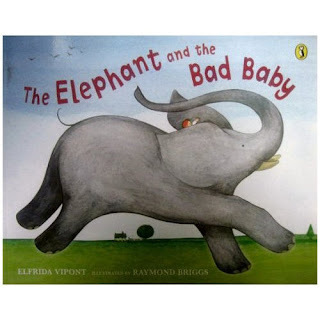 1.The Elephant and the Bad Baby by Elfrida Vipont and Raymond Briggs. There's something in kids, and those who still haven't grown up, that responds to Bad Babies. Add an elephant to the mix and how can you fail? I love the repetition of rumpeta, rumpeta, rumpeta, I love the politeness of the stealing elephant, and I so love that bold, bad baby! 2. Possum Magic by Mem Fox and Julie Vivas Mem Fox is my hero, and I adore her books. Julie Vivas is one of my very favourite illustrators. No wonder this picture book has sold millions. One of the classics, and still a favourite today, I love to read this to kids because of the opportunities it gives them to dream. 4. Ten Little Fingers and Ten Little Toes by Mem Fox and Helen Oxenbury What a wonderful combination of talent! This is the perfect book for little ones - great rhyme and rhythm, a wonderful understated message, and opportunities to "read" alone when the kids have memorized it. Lots of opportunities for varying your tone and taking on character voices when you read this one aloud. It's a charming story with just the right amount of tension before a joyous, uplifting ending. Mem Fox. Need I say more? I love rhyme and rhythm when they are done as superbly as Columbia Sneezes. This picture book about a camel with a problem will have delighted kids joining in the sneezy refrain. A very special friend found this on ebay and sent it all the way from the USA because she thought it was important I should know it. She was right! I think kids need fun picture books that help them cope with scary stuff. Good rhyme is hard to find, and being found, must be prized. All of the books in this series are wonderful. This one just tickles my sense of humour. A little boy must carry a yellow balloon so his grandmother can find him. Well, there you have it: BoCho's Top Ten Picture books. Share any of your favourites in the comments. Wow - I loved "Elephant and the Bad Baby" growing up! Thanks for the flashback! Recent blog post: Review #21: Jazzmatazz! Alas, I was all growed up when I encountered that Bad Baby, Z-Dad, but I loved it just the same! Recent blog post: Let's Celebrate! I know what you mean ... I can't stop thinking of books for the list and now I wish I'd remembered Tikki Tikki Tembo, and Dogger! Oh of course... ! I can't wait until the top 100 are finally up at Fuse 8.